Captain Midnight argues with Agent Jones, Charlotte, and Marshall about the status of world events, and is horrified to learn that his old enemy Fury Shark is a wealthy and successful tycoon. Jones tries to take Midnight into custody and they get into a brawl, which ends when they agree to work together to investigate how Midnight was allowed to escape from the USS Ronald Reagan in the first place. Jones and Marshall head back to the carrier to look into the details there, while Charlotte and Midnight stay at the Secret Squadron base to continue going through files that have appeared without any sign of who left them. Fury Shark, meanwhile, sets in motion a plan to lead Midnight to his doom. On the USS Reagan, Marshall and Jones investigate who let Midnight escape, only to find that it was the ship's captain, Commander Johnson. As soon as he is discovered, Johnson has the MPs take them into custody. Back at the Squadron base, Midnight detects the fake signal from Fury Shark, and takes Charlotte on an airplane recon mission to find the source of the signal. They are shot down and end up at the old base of Ivan Shark, captured by Fury and her men. This second issue is packed full of interesting scenes, with some good action but also some decent character development. Charlotte continues to be a favorite of mine, with a strong personality and plenty of "street smarts." 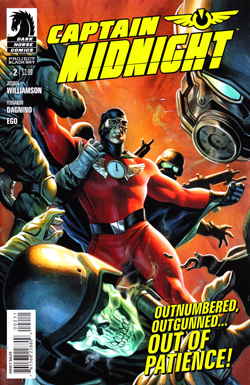 Captain Midnight remains a bit of an enigma -- he's pretty hot-headed, which makes me wonder just how exactly he survived as long as he did in World War II. Agent Jones is more interesting this issue. He is still working for the government but he's smart, and he thinks for himself rather than just following orders. He's also a bit of a hot-head, and I like how Marshall keeps stepping in to calm things down and stop Jones from going overboard. One thing I'm not sure I like about this series so far is how ordinary all the names are. Last names like Jones, Ryan, and Johnson are not only rather bland but they are also so generic as to be indistinguishable. Several times I did a double-take seeing Jones and Johnson mentioned, as I'd begun to mix up their names. Williamson should have done a better job of coming up with names that are a little more unique to help readers with this new set of characters. Fury Shark, on the other hand, is making a pretty good villain. She's smart, competent, and completely ruthless. I like that she turned the tables on Midnight, capturing him in the same place where he defeated her father all those years ago. And it was a nice twist that Fury put Charlotte out in the snow against the polar bears to get back at Midnight. I'm curious to see how Charlotte gets out of that one. The art was once again fairly solid in this issue. The layouts are conventional, which is not a bad thing -- they don't distract from the story. The backgrounds are generally good, and both action and quiet scenes are drawn with equal skill. Dagnino inks his own work, and does a very good job of it once again. Overall, this was a reasonably good story with very good art, and it definitely held my interest. The opening story arc supposedly concludes on issue 3, and I can't guarantee how much longer I will keep up with this series, but it's good enough that I will certainly at least get the next issue... and I may well put it on my pull list after that.